This B-24 Liberator, 42-51272, “Dear Marion” and crew were assigned to the 706th Squadron of the 446th Bomb Group. On November 30, 1944, they were hit by flak and shot down over Neunkirchen, Germany. On January 30, 1950, two members of the crew were buried in Section E Site 266 of the Zachary Taylor National Cemetery. The marshalling yards were bombed through solid cloud cover. A plane 42-51272 received a direct flak hit in it's bomb bay, split in 2, and crashed. The pilot was blown free by the explosion and parachuted safely to the ground where he was taken prisoner, but the other 10 crewmen were killed. Another unnamed plane (42-51115) was severely damaged by debris from the explosion of the first. One crewman was killed by the debris, another bailed out but died later. The remaining 8 bailed out and landed safely in Allied occupied territory. This B-25 and crew were assigned to the 448th Squadron of the 321st Bomb Group. 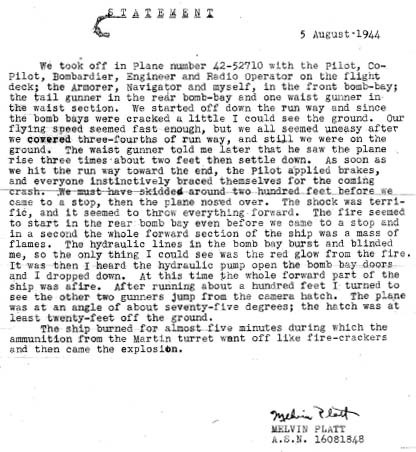 Two members of the crew were killed on June 13, 1944 after receiving a direct hit of flak on the nose of the plane. They were buried in Section E 11 at the Zachary Taylor Nat’l Cemetery on December 22, 1948. 448th BS War Diary: Mission 272 (394): At 10:18 19 planes off to bomb Sarraferrato RR/viaduct and dropped 72 x 1000 bombs at 11:33 from 10,000 feet. All returned at 12:30. Crews report good concentration, especially heavy on N end and approach. N span believed knocked out. Heavy, moderate and accurate flak from SE of Lake Trasimeno holed 5 planes and 1 PLANE, pilot Lt. Greene received a direct hit in the nose, killing Bombardier Lt. Petite and the Navigator Lt. Olszewski and causing the rest of the crew to bail out over the home base to safety. Heavy traffic along the coast roads. This B-26 Marauder, 42-95878, “Weary Lera,” and crew were assigned to the 1st Pathfinder Squadron. They were shot down in the Luxembourg area on December 23, 1944. They were buried in Section E Plot 133 on September 20, 1949 at the Zachary Taylor National Cemetery. The Garbisch crew was with the 1st Pathfinder Squadron. The 1st Pathfinder Squadron was an independent unit belonging to no parent Group. Formed in February 1944 from a cadre drawn from 322nd, 323rd, 344th, 386th and 387th Bomb Groups. This aircraft was pathfinder for the 322nd Bomb Group, leading them to their primary target, the Euskirchen Railroad Bridge, Germany when attacked by German fighters. On July 31, 1944, this B-24 was involved in a crash on take-off with seven crewmembers killed and three surviving. They were assigned to the 722nd Squadron of the 450th Bomb Group. The crew was buried on November 18, 1949 in Section E 197 at the Zachary Taylor Nat’l Cemetery. This B-24, 42-51870, was assigned to the 720th Squadron of the 450th Bomb Group. On April 9, 1945, their aircraft was believed to have been hit by a bomb cluster dropped by the preceding group. Two members of the crew were buried in Section E 220 at the Zachary Taylor Nat’l Cemetery on December 8, 1945. This B-24, 41-29272, was assigned to the 721st Squadron of the 450th Bomb Group. They were shot down on April 25, 1944. Six members of the crew were buried on February 16, 1950 in Section E 276-277 at Zachary Taylor Nat’l Cemetery. Waiting on ACFT, parking area. Flying with a new crew as the old crew disbanded. Pilot, bombardier, crew chief, and co-pilot killed while landing crippled B-24 (Paper Doll) in pasture. They were attempting to bring plane back to base after maintenance at other airfield. Weather clears enough for take-off. We wanted to be grounded for the day because Marlene Dietrich was to perform as part of USO troupe. Tail gunner Brown, from Iowa, was the only one with cigarettes while we were waiting. We all had one on him. The mission was for ball bearing plant in northern Italy. I was flying lower ball turret. After take-off ACFT in formation. Weather very closed in. Time of flight – 11:44 hrs. Alps & Switzerland in sight. German fighters all around. Formation spread out in clouds to keep from colliding. Saw lead plane shot down. No chutes visible. Our turn – German ME 109s (Messerschmitt) coming in form 12 o'clock high. Took out leading edge of wing, cockpit, etc. Came in from sides & tail. Waist gunner remarked, "This is the end." Waist in flames. Oxygen bottles punctured and explode. Can't see from the flames. Look for chest chute. Tell others to follow. Plane going down. Find chute. Leave via waist hatch (lower camera hatch). Altitude approximately 20,000 ft. Don't remember pulling rip cord, as I must have passed out due to lack of oxygen. Seem suspended in air. Remove glove to see if it drops ahead of me. Look down. See plane on ground in flames. "Lucked out!" Landed very hard on back. Thought my leg was broken. My boot was full of blood. I saw two people cutting wood, and I offered them one dollar from escape kit. I asked them, "Where's Rome?" They pointed south. I asked, "Where and how far?" They didn't respond. No speak English! More scared than I. Soon saw two people with uniforms and binoculars calling out, "Hey, Joe." I hid under a bush after hiding parachute. Didn't trust them because I was in German territory. Bad pains. Must trust someone or bleed to death. I waved to them. They picked me up and carried me down mountain. I tried to escape from them as I was sure they were enemy. Took me to farmhouse. Very nice lady stripped me and put pail of lard on face. Very badly burned. Washed blood off. Thirty-seven fragment wounds. Had to leave before daylight as Gestapo were in area. Would eliminate the people I stayed with if they were caught harboring Allies. I couldn't walk. Provided me with mule. Not too cozy to ride on. Had two 20mm cannon shells – one lodged in leg, other exited. After some time, I was taken to party of underground, consisting of English, New Zealanders, South Africans, etc. In the meantime the navigator was brought in uninjured, but very weak mentally. We had to carry his gear. Moving everyday. Germans everywhere. Partisans raided the Fascists. Food, wine, etc. Captain in charge Ian McCodell of Johannesburg, South Africa of tank corps, was captured in Tobruk. Beautiful man, but tough! Pills in escape kit to be used in emergency. Many rough days. Hardly any food. Italians provided bread and goats milk. Enough to service. So much walking. People in group very nice. Ask about American girls! 4th of July – sitting in woods. German re-con spotted. We ran like crazy. Watched while they destroyed our camp, medical supplies, etc. Very mad! $50.00 in escape kit. Shared it with all the other partisans. Built shelters from the woods. Large enough to lay down in for protection from rain. Flight suit – full of holes. Cut off legs and sleeves. Partisans gave me a pair of heavy mountain climbing shoes – ankle length. Steel cleats in soles. Need haircut! Sneaked into village. Ten year old boy barber. Clothes full of lice. Feel like a monkey picking them out of hair and clothes. No soap or tooth paste. Received blue slacks and blue shirt. Capt. McCodell nicknamed me "little boy blue." Rumors flying – to be rescued by submarine soon. Bunk! 5th of May – I wonder how Nanian is doing? See lots of Jerry Aircraft – Stukka dive bomber flew right over us. Wish I had a cannon! Allied Aircraft, flying south. Soon they will be back at their base – how I wish I were on board. A pilot and gunner from shot-down B-25 joined us – also Polish officer deserted German Army. Italian doctor (trained in Brooklyn, NY) brought in to remove shells from thigh. Turning green – very painful. Had very little medical equipment. No Novocain. Used scissors to enlarge hole to remove shell from leg! Ouch! Prayed to die. Hurt very much! Forgot a lot that happened. Very happy to be alive. Thought about home and relatives a lot. Finally had to make a break for Allied lines. No food. Lots of Germans. Formed formation – single file – hundreds! Made for Florence. German gun position killed 25 in front of line. Everyone panicked. I made it over 20 ft. fence into cornfield. Stayed until daylight. Rained very hard. I looked awful! Heard Italian ladies talking very loud. Knew they were alone. Took a chance and advanced. Asked if there were Germans around. They said, "No, come in." Stayed in home while town being shelled by both Germans and Allies. German soldiers at front door. I went out the back door to olive orchard. They left and I returned to house. I and an 80 year old man slept upstairs. All women and children were so scared they slept in cellar. Shells landing all over neighborhood. No memory of how long I stayed at this house. Finally man took me on bike down town through all kinds of military over bridge to Canadian guard. What a relief. The first thing I knew what to ask for was Lucky Strike. They had one. Received new uniform. Was transported to Naples by jeep. After arriving in Naples, hopped an English C47 to Bari than to home base at Manduria. Sqd. Commander Stevens glad to see me. Gave me $20.00 to spend at PX. Then on to Naples for Boat trip home. Was told there by military, "You're going home." Stayed in Naples for a few days, waiting for ship transport. Thirteen days on ocean (sick thirteen days). Arrived New York City. Moved to New Jersey for the debriefing and furlough (approx. 30 days). Then to Miami Beach. President Madison Hotel for rest and recuperation., While in Miami Beach, met the nose gunner in Mess Hall. Had not seen him since we left on mission. Had it made there. Train to Eau Claire. Then to North Dakota. How beautiful that farm looked! Mom and Dad and all glad to see me. My family gave me a Gold Gruen watch. Everyone here so nice. Had a big party at Kellers! Everybody was there. Also had a party at Coopers "White House"! To Truax Field Madison, Wisconsin. Then to Chanute Field, Rantoul, Illinois. Worked on flight line. Crew chief on AT6. Discharged in August 1945, Ft. Sheradan, Ill.
Puerto Rico, Belem, Brazil, Natal Brazil, Dakar West Africa, Senagal, Marrakech, Morocco to base at Manduria, Italy.